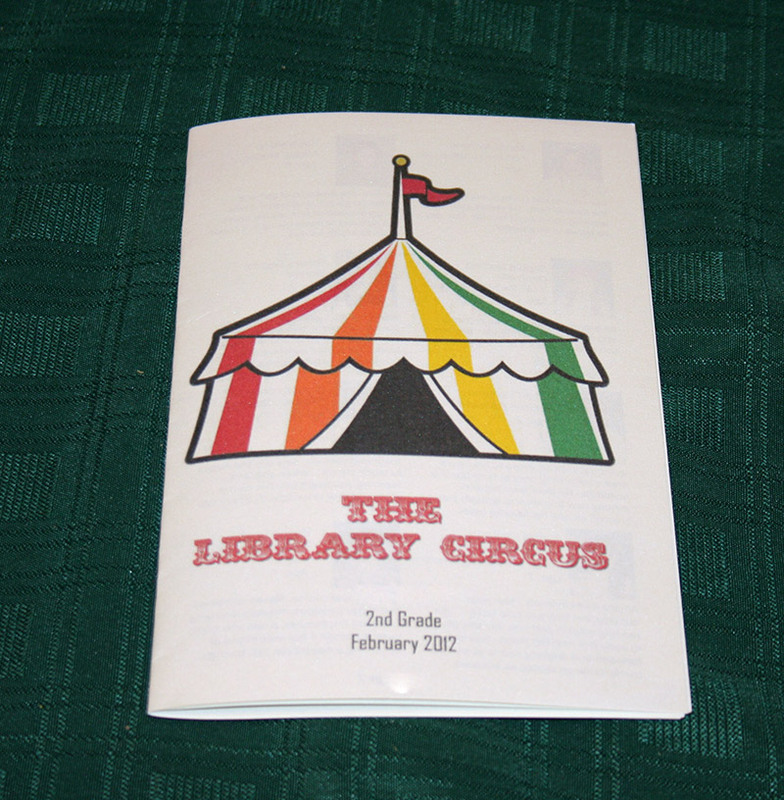 The Library Circus came to town and Amara stole the show! Amara before the show started without her hat. What a whirlwind it has been. 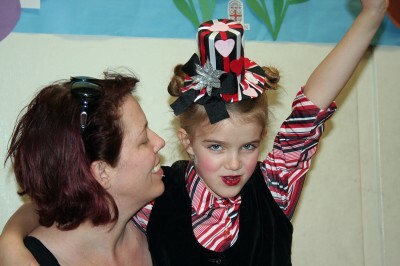 I am so proud of both Amara and her Mommy. Amara did a wonderful job of learning all of her lines. (She had the most!) She was born to play this role! But I’m extra proud of Jenna (my amazing daughter) for orchestrating the whole thing. She has spent the last 2 weeks getting this play ready and it was amazing to watch it all come together. She had a blast creating Amara’s Barker costume. Most of it came from different Etsy shops and she spent hours finding the perfect pieces. Or at least we thought they were perfect. The striped shirt was so cute but it was made of that silky polyester fabric that all shirts in the seventies were made out of and it would not stay buttoned! (safety pins!) 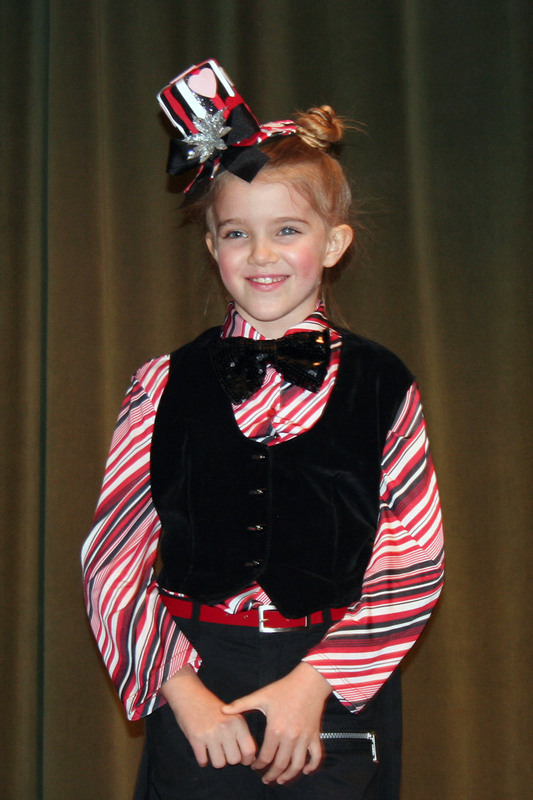 The little black velvet vest had the cutest buttons but was at least two sizes too big. We took it in and it looked very cute, especially with the black sequined bow tie she found. It all went perfectly with her black pants and her black knee high boots! BUT the best part of course was that hat! That hat was fabulous! When she isn’t gathering audiences, our barker Amara favors creative expression in fashion and art. She loves reading and watching movies. One day she hopes to be an Interior Designer. He put a lot of time and thought into making each of those 29 bios entertaining and special. The audience enjoyed reading them as they waited for the show to begin. He is such a wonderful and involved Dad. I laid out the whole thing in Photoshop including thumbnail photos of each of the students next to their bios. I had lots of proofing help from Jenna and Justin. What a work of love they were by all of us. Jenna even found some special paper to have them printed on! Amara on stage just before the show started. I watched them all as they got their make-up put on. One of the Mom’s used to be a clown for kids parties. She was in charge of the makeup, both getting it on and off. 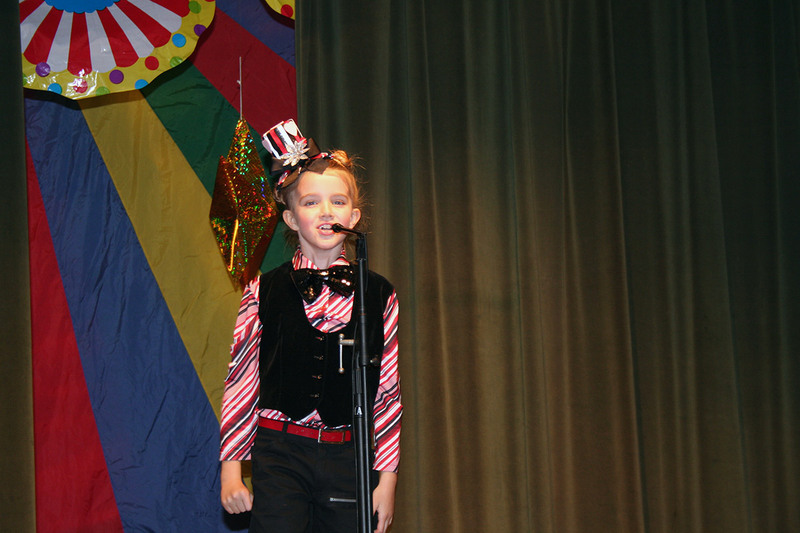 Plus she isn’t much bigger than most of the 2nd graders and she had helped outfit the clowns. Most of the other students were dressed as animals and each of them looked so cute in their animal costume. Some of them had been purchased. Many of them had been made or were handmade costumes from some other event. One Mom made 3 of the dog masks without a pattern! SO cute! These Moms were all so great. And I got to be part of it! I was there from the first planning meeting, to rehearsals and through all four shows. For both shows on the second day I was assigned the job of CostumeChanges/Children Wrangling along with one of the other Moms backstage! Grandpa Richard wore a tie just for Amara! The first show was Wednesday morning for a huge room full of students. These kids did 4 performances in two days! The “big” show was Wednesday night for all of the parents, family and friends. 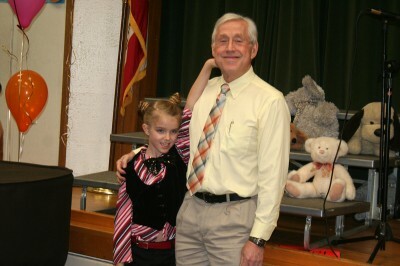 I was so glad they were doing an evening performance so that Grampy and Amara’s other grandparents could all be there. She had her very own cheering section. The house was packed! All of students had a little bit of butterflies beforehand and there were some gasps when the curtains first opened and they saw how many people were sitting out there but it didn’t faze them. They all did a wonderful job. THEN there were two more shows the next day — one at 8:45 and one after lunch at 12:45. This meant everyone had to change out of their costume for class and lunch and then back into their costumes — and we pulled it off! They were great. They were exhausted. We were exhausted. It was a huge success! Amara and her opening lines - Hurry Hurry Hurry! Each time the play ended Amara’s teacher thanked all of the students for their hard work. Amara has gotten another wonderful teacher this year and she worked hard on this production. 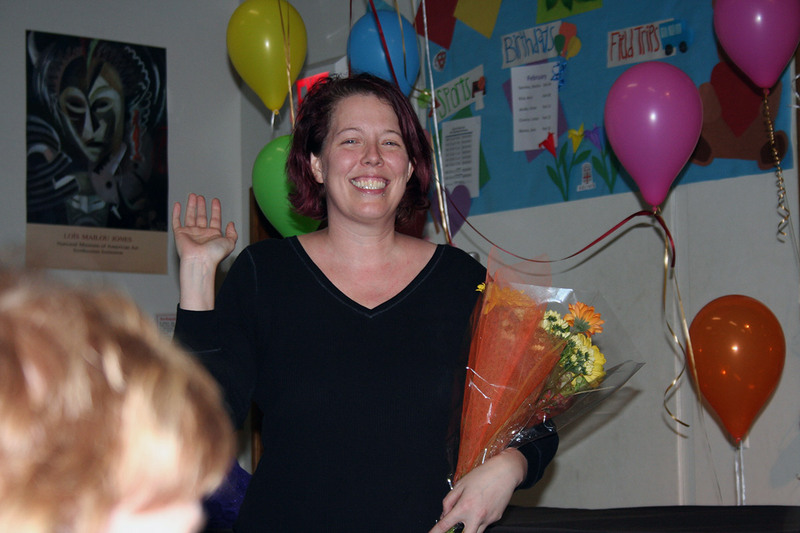 She thanked many parents individually for their contributions as well as thanking all of the parents for being so supportive. Then she gave a special thank you to Jenna for being her Assistant Director and Classroom Cheerleader. She talked about how without Jenna’s endless hours of help, her daily email correspondence with the parents about what was needed and how they could help, the play would not have been what it was. I was so proud of her. 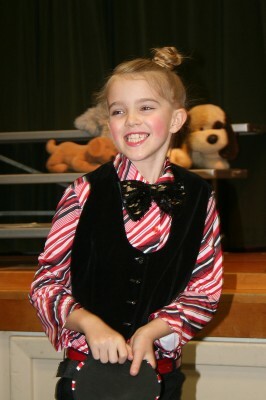 On the Wednesday evening performance she presented Jenna with a bouquet of flowers. I had tears. Grandma had a wonderful week! This memory was posted in Special Occasions and tagged Amara, daddy, Library Circus, Mommy, school on February 19, 2012 by Grandma Kc. Love the outfit! I have such fond memories of my school plays. I’m glad that some teachers are still willing to put in the work that a play entails. Also that some talented parents are willing to help. Amara loved her costume, too! You can tell! She does have a great teacher with 33 years of teaching and 30 of them at Amara’s school! And she is still willing to do all this! Since Amara started kindergarten at that school I have just been amazed at the great teachers and at how involved so many parents/grandparents are! I think it is wonderful! Now that looked like an ambitious production. Four shows! I am seriously impressed with students and adults involved. I was just amazed that 29 second graders made it through all those rehearsal and 4 productions without one melt down! What a beautiful memory for everyone! Amara’s costume is adorable! Good work everyone!!! How great! I always loved school plays but, even better, were the backyard plays we put on as kids. I have to think Amara does that, too, or should. She really hasn’t done a lot of backyard plays, mostly because there aren’t any kids her age in her neighborhood that she can play with. Maybe she does when she goes on play dates at her friends and I just don’t know about it. But now that Grandma has kids in her neighborhood, and now that she has gotten exposed to the theatre maybe there will be some neighborhood productions around here! Oh my gosh! How fun it all looks and I am so happy for you that you got to be a part of such a fabulous event! I had forgotten about school plays until I read your entry – I can’t wait until my little ones get old enough. Amara looks so cute and your daughter’s smile is wonderful. Looks like it was a stupendous success! Great family effort! Love, love, love the barker costume. Amara looks beautifully happy. It’s not hard to see why, though, with the love and participation from family in a great event. Kudos to ALL! I still love this post. Amara is such a special young lady with a brilliant smile. Thank you for linking to the GRAND Social and reminding me of this lovely time for you all. So sweet!